Rare footage of Shirley Horn in Holland in 1981. I think this was from the North Sea Jazz Festival. Nine minutes of Shirley Horn makes me very happy. 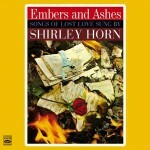 A bit of Shirley Horn for your Sunday. Enjoy! I will be remembering jazz great Shirley Horn on the radio tonight between 7:00 pm and 8:00 pm PST on The New Jazz Thing with Vince Outlaw on Jazz 88, KSDS San Diego, 88.3 FM with World Wide Webcast at http://Jazz88Online.org! Please tune in! Now available on podcast.